Buy a CHAIN & SPROCKET SET. PT.NO. 917D/3. 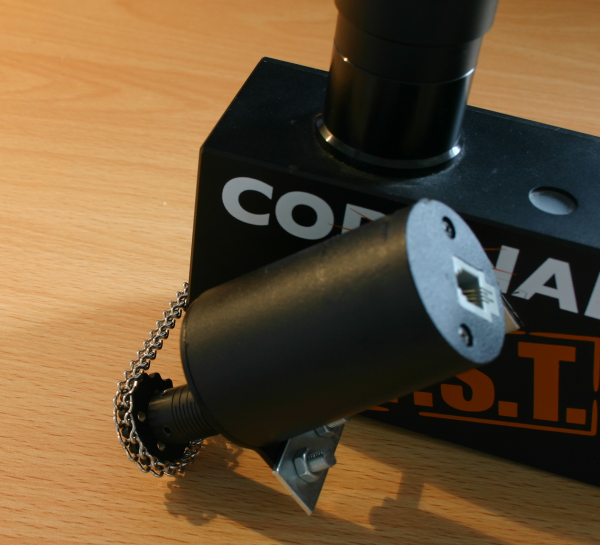 Consisting of: 2 Sprockets(917D2445), 2 Sprockets(917D2446) & 1m approx Chain(917D2449) made by MFA/COMO DRILLS. 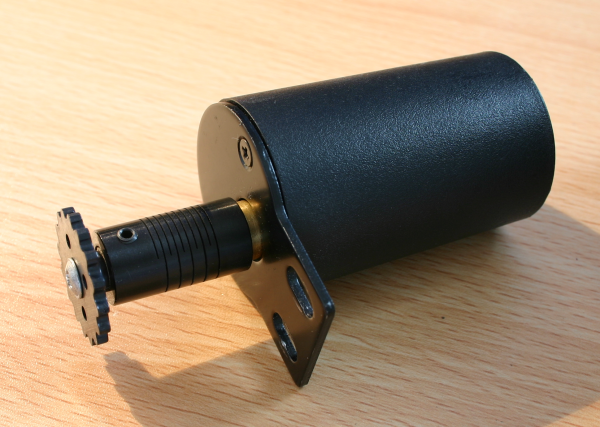 Buy an Orion AccuFocus motorised focuser. Buy a 50mm L bracket and 2 small bolts and nuts. Cut a hole in one of the big sprockets slightly smaller than the diameter of the PST focus knob. File the hole until the sprocket just slips onto the knob. 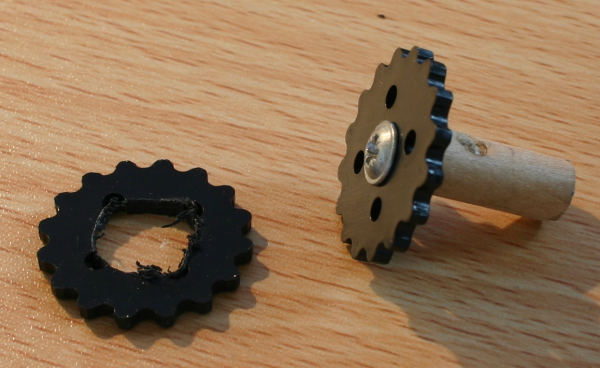 Use a small screw to fix the other big sprocket onto a wooden dowel pin. Fix the black, springy AccuFocus coupler to the motor drive and fix the dowel pin into the coupler and tighten the 2 set screws. Drill a new hole(s) in the 50x50mm angle bracket to suit the AccuFocus. Mount AccuFocus to bracket with the 2 bolts. 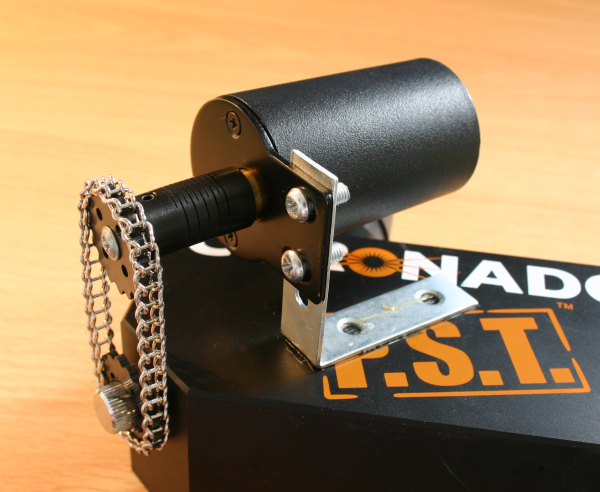 Hold the bracket in place on the side of the PST and position it so that the chain sprockets line up. Mark the position of the bracket on the side of the PST. Remove the paint from the side of your PST under the bracket. Remove the AccuFocus and impact glue the bracket in place. When the glue is set hard, mount the AccuFocus to the bracket. Wrap the chain round the sprockets and note the link which will give a tight chain drive. Disconnect this link using needle-nose pliers and then reconnect it to the other end to give a chain loop. Remove the sprocket from the focus knob. Wrap the chain loop over the motor sprocket and place the focus sprocket inside the loop. Slide the focus sprocket over the focus knob. The springy coupler will keep the chain in tension and keep the focus sprocket from coming off the knob. You can adjust the chain tension by adding or removing links from the chain loop. Plug the Accufocus cable into the motor and hand control. Turn the speed knob to the lowest setting and press the up and down buttons on the controller. When you are happy it is running smoothly you can turn up the speed. The AccuFocus will turn at 1 turn every 14 seconds at top speed. This is ideal for imaging work and you can turn the speed down if needed for high mag work. You can mount one of the smaller sprockets to the motor for an ultra-slow focusser but I find it is just too slooow. You can slip the PST sprocket and chain off for manual focussing. 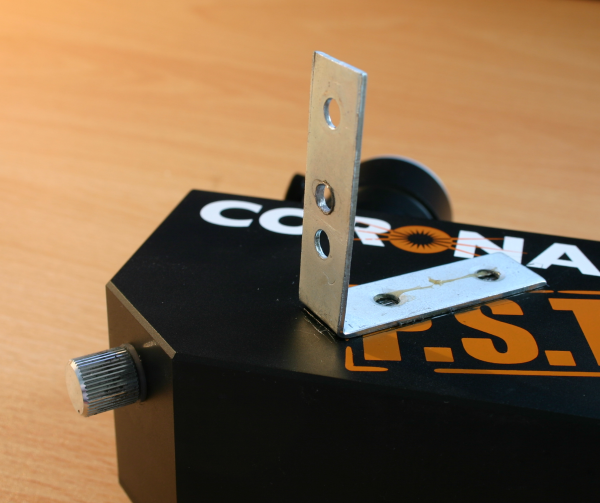 Next tutorial – Motorising your PST tuning ring! Good stuff Kev. I think this along with the motorised tuner turn the PST into a very nice imager. Maybe you should start selling kits. It occurred to me that USB motors would give you a lot more control options. Maybe for my next scope setup.